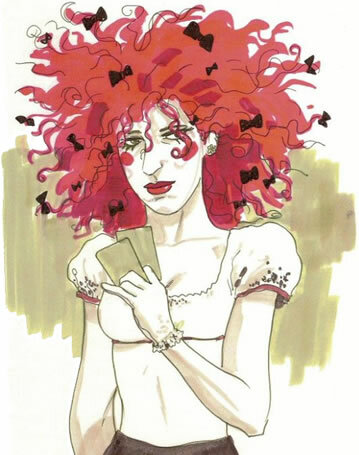 A graduate from Chicago’s American Academy of Art, Jill Thompson (1966 - ) proved a versatile, realistic illustrator and rose to prominence at Vertigo drawing Black Orchid and especially collaborating with Neil Gaiman on Sandman. Graduating to fully painted artwork, she won praise and awards for her subtle watercolouring. Another breakthrough was the overlooked Finals, an offbeat campus satire for Vertigo written by Will Pfeiffer. But the biggest revelation came in 1997, when Thompson first went flying solo on her broomstick and both wrote and drew the first 40-page story of her Queen of Halloween. In a brave departure from their typical comic book pamphlets and Goth angst, publishers Sirius Comics showcased her shimmering colour washes in a totally charming fantasy for all ages. Jill and Scary Godmother worked their magic and crafted four sequels, published each year in time for Halloween. Delirium, the youngest of the Endless, prevails upon her brother, Dream, to help her find their missing sibling, Destruction. Their travels take them through the world of the waking until a final confrontation with the missing member of the Endless and the resolution of Dream’s relationship with his son change the Endless forever. An energetic, light and breezy, original story that parallels the events of Neil Gaiman’s Sandman Vol 4: Season Of Mist. Lucifer has abandoned Hell, tossed out it’s inhabitants and given Sandman the key. Hell’s evictees crash at Death’s place, where her sisters, Despair and Delirium, throw them a party which quickly gets out of control. It’s up to Death to figure out how to save the day and the afterlife… not to mention the carpet. Welcome to Burden Hill - a picturesque little town adorned with white picket fences and green, green grass, home to a unique team of paranormal investigators. Beneath this shiny exterior, Burden Hill harbors dark and sinister secrets, and it’s up to a heroic gang of dogs - and one cat - to protect the town from the evil forces at work. These are the Beasts of Burden Hill - Pugs, Ace, Jack, Whitey, Red and the Orphan-whose early experiences with the paranormal (including a haunted doghouse, a witches’ coven, and a pack of canine zombies) have led them to become members of the Wise Dog Society, official animal agents sworn to protect their town from evil. This turns out to be no easy task, as they soon encounter demonic cannibal frogs, tortured spirits, a secret rat society, and a bizarre and deadly resurrection in the Burden Hill cemetery-events which lead to fear and heartbreak as our four-legged heroes discover that the evil within Burden Hill is growing and on the move. Can our heroes overcome these supernatural menaces? Can evil be bested by a paranormal team that doesn’t have hands? Scary Godmother is a lavishly illustrated, all ages, horror-comedy-adventure series, for which Jill Thompson has won two Eisner Awards.